When the City of Miami enacted the Chaille plan to rename the streets of Miami in 1920, Flagler Street and Miami Avenue became the center of downtown Miami. Just north of this intersection is a block that was heavily influenced by one of Miami’s earliest pioneers. One can walk north on Miami Avenue from Flagler Street and see this pioneer’s name etched at the top of a two story building located on the west side of the block. The building’s etching simply reads “Waddell Bldg”. While the name EA Waddell may not be as familiar a name as Julia Tuttle, Henry Flagler or Mary Brickell, his influence and passion for the City of Miami is comparable to the familiar names that founded Miami. His influence was felt in real estate, banking and many of the early civic organizations of Miami. His home was the second home to be erected on the north side of the Miami River, when the remnants of old Fort Dallas and the trading post on Brickell point furnished the only signs of human occupation. Many early Miamian’s considered him one of the “real builders of the city”. Waddell was even described as being a part of a prominent group of men referred to as “The Hungry Six”. This group of men was living in Miami so far ahead of civilization that even a dog’s howl at night would represent encouragement for breakfast. The frontier days of Miami represented a time of limited options for sustenance. EA, or Edwin Alexander, Waddell was born in Perth, Ontario on August 13th in 1859. At the age of 18, in February of 1877, EA left Canada and moved to New York. He got involved with a wholesaler of dairy products and worked there for nine years, investing in the company and eventually running it as the head of the organization. By 1886, Waddell came to Florida and settled in Key West. During his time in Key West, he made investments in an orange grove in Arcadia and invested in a cattle ranch in Central Florida. Waddell’s first visit to what would become Miami happened by accident. In 1888, he and his brother decided to take a trip to Palm Beach to visit a friend. They were traveling by boat when one of the sails of the boat gave way. They needed to go ashore to repair the sail. By happenstance, they landed at the banks of the Miami River. EA Waddell was so impressed with the area that he made a promise to return and build a home. Much like Julia Tuttle and William Brickell, Waddell knew that the shores of the Miami River would soon be the site of a great southern city. He was quoted as saying that “this is going to be the site of a big city. I am going to come back and cast my lot and help to build and develop this new city”. Waddell later came back to Miami and bought land. As 1896 approached, he would establish a residence in Lemon City and come down to Miami where he engaged in survey work to locate the land he had purchased a few years earlier. Given the limited options for accommodations in the area, EA Waddell checked into the Hotel Miami after its completion. This was the hotel built by Julia Tuttle to accommodate all those that were flocking to the area after the announcement that Flagler would extend his railway to what would soon become the City of Miami. EA Waddell’s Poured Concrete Home. Waddell would not stay in Hotel Miami for long. He was believed to be the first Miamian to have built a poured concrete home in the city. This home was located at the southwest corner of NE Second Street and NE Third Avenue. Waddell’s poured concrete home was torn down in the mid-1950s to make room for a surface parking lot. Today, the site of Waddell’s former home is a three story building that was built in 1979. Some downtown residents may know this building as the location of Elwood’s Pub. EA Waddell was not only civic minded during the early years of Miami, but he also served on Florida Governor Albert Gilchrist’s staff from 1909 to 1913. It was during his service to the governor that he got the title of Colonel Waddell. It may have been more of a nickname than a title. In one of the earliest history books written about Miami in 1921, the author, E.V. Blackmon, confirmed that EA Waddell was present when the first train arrived in Miami in 1896. While Waddell maintained his interests in Central Florida, he and a partner, a gentleman by the name of Johnson, also had a significant real estate holding in the area just north of the downtown district. This area was known as North Miami after the incorporation of the city of Miami in 1896 because it was just north of the city limits. The tract of land was known as the Waddell & Johnson tract and consisted of 120 acres. The FEC Railway ran along the western edge of this tract of land. Once Waddell realized that the FEC right of way ran along his property, many believed that there would be a train depot built somewhere on this tract of land. North Miami did not place the same restrictions on alcohol that Miami had placed in its charter. Therefore, North Miami was the location of saloons and raucous behavior following the incorporation of Miami. The land that was part of the Waddell and Johnson tract would today be located above 14th street and east of the railroad tracts. It would be considered part of the Omni and Edgewater neighborhoods today. So significant was Waddell’s impact in North Miami that today’s 15th street, from west of the railroad tracts to Biscayne Boulevard, was named Waddell Street prior to the streets being renamed. It was changed to 15th street as part of the Chaille Plan to rename all streets of Miami in 1920. Shortly after incorporating in the 1910s, the City of North Miami was part of the annexation of territory by the City of Miami in 1913. The annexation included territory as far north as Buena Vista and as far west to include much of what we know as Little Havana today. 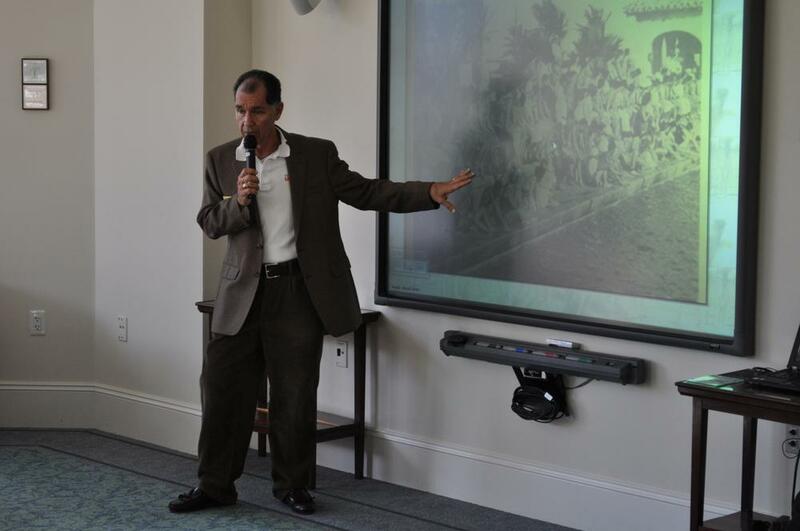 The City of North Miami prior to 1913 is not the same City of North Miami that we know today. Today’s version is located above the City of Miami Shores. My great grandfather, Jay Combs, along Justice WC McCall, were the organizers of taking the census prior to the annexation in 1913. The city leaders wanted an accurate count of the impact of the annexation on population size. It was determined that the City of Miami grew from 13,000 to a total of 20,000 residents as the result of this annexation. EA Waddell opened the first real estate office in Miami and he remained in real estate throughout his lifetime. His office was originally located at 239 12th street (later renamed Flagler Street). The office later moved to 105 NE Second Street in the 1920s, which was across the street from Gesu Catholic Church. Waddell had a policy of only selling property that had the potential to be improved. He maintained his integrity in real estate sales even during the frantic 1925 real estate boom. This boom was a time when binder boys were quickly flipping lots that most likely were under water. Many of the buyers purchased the lots without ever seeing them. Waddell had no interest in participating in the practice of flipping lots. The early focus of Waddell & Johnson was to sell the lots that they owned and platted. Many of his early buyers were Waddell’s friends from Key West. The steamer that ran between Key West and Miami paid early dividends for the duo. Prior to the time of his death, his real estate interests were so vast that he held the distinction of owning the largest coconut plantation in the world, located on one of the keys near Cape Sable. While real estate may have been Waddell’s primary business interest, he was also very involved with Miami’s early banks. The Bank of Bay Biscayne opened its doors for the first time on May 2nd, 1896. It was the first state bank to open in the newly incorporated City of Miami. Henry Flagler ensured the early success of the newly formed bank by making regular deposits to keep the bank solvent. After early trepidation, the citizens of Miami began to trust the bank and deposits increased rapidly. After seeing the need for more than one bank, Waddell helped Edward Coleman Romfh found the First National Bank on June 10th, 1902. Romfh was a bookkeeper for the Bank of Bay Biscayne prior to becoming the first president of First National Bank of Miami. Waddell was both a founder and a member of the board of directors. Other notable officers of this new bank were WM Burdine, John Seybold and James E. Lummus. First National opened for business on December 1st, 1902. From the day of its opening, the bank was largely successful. A roomy and comfortable bank building was opened on the corner of Twelfth Street and Avenue C (Flagler Street and NE First Avenue). This building would suffice for the first 20 years of business, but the bank quickly outgrew the original building. The 1902 First National Bank building was replaced with a ten story bank building in the same exact location. The new building opened for business in 1923. 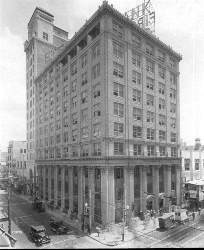 This ten story building still sits on Flagler Street today at 101 East Flagler Street. It was renovated and converted into the First Flagler Condominiums. The renovation effort may have inadvertently preserved the “First” from the First National Bank name to provide a connection to its past as a bank building. Most likely the “First” in the name was just referring to the avenue running adjacent to the building, but it is nice to believe that there was some historic link associated with the name of the condominium building. History has a funny way of linking coincidence with irony. In addition, the residents of First Flagler retrieve their mail from the vault of the old First National Bank. It was said that it was so difficult to try to remove the very heavy vault from the building that the renovation team chose to just leave the vault and use it for the mail room. First National Bank remained at 101 East Flagler Street until it moved into a new building on Biscayne Boulevard in 1959. The new bank building resided at 100 South Biscayne and featured parking on premise. This was a new concept for downtown buildings in Miami at the time. The bank later moved across the street to the Wachovia Building in 1983. Today, Vitas Healthcare resides in the 100 South Biscayne building. The bank operated as First National Bank of Miami until it changed its name to South East Bank in 1969. It continued to operate as South East Bank until it was liquidated by the FDIC in 1991. EA Waddell was responsible for the development of part of Avenue D just north of 12th Street in the 1910s. Avenue D was later renamed Miami Avenue and 12th Street was renamed Flagler Street in 1920. Many of the original buildings are no longer standing on this block, however, Waddell’s named building still remains. Although the two story building appears to need a paint job and some restoration work, it does represent a style of building very prevalent in the early part of the twentieth century. Offering both a store front ground level and a second story which features a balcony for either hotel or apartment dwellings. The Waddell Building was built in 1914 in an architectural style called Vernacular Commercial. It was appropriate for the time because it combined both retail and residential opportunities in a growing urban area. 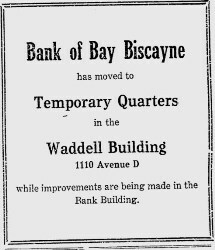 One of the very first tenants of the Waddell Building was the temporary home of the Bank of Bay Biscayne in 1915. The bank was replacing its single story building with a much larger bank building in nearly the same spot, and needed a temporary location to conduct business during construction. 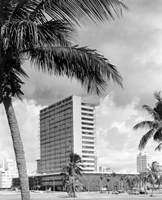 From its inception, the Waddell Building featured some notable tenants that were very popular with early Miamians. One of those locations was a delicatessen called the ‘Boston Lunch’ which open its Waddell Building location in 1919. Another prominent tenant was Fay’s, a famous women’s clothing store. Fay’s started doing business at the Waddell Building in August of 1928. On the second story, the Waddell Building operated as the Waddell Apartments from shortly after its opening in the mid nineteen teens until 1930. At that time, the Waddell Apartments gave way to the Neal Hotel. 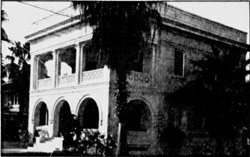 The Neal Hotel operated at 30 N Miami Avenue from 1930 until 1941 when Mrs. Esther J Rice began to operate the Rice Hotel. This hotel featured 30 rooms for rent. 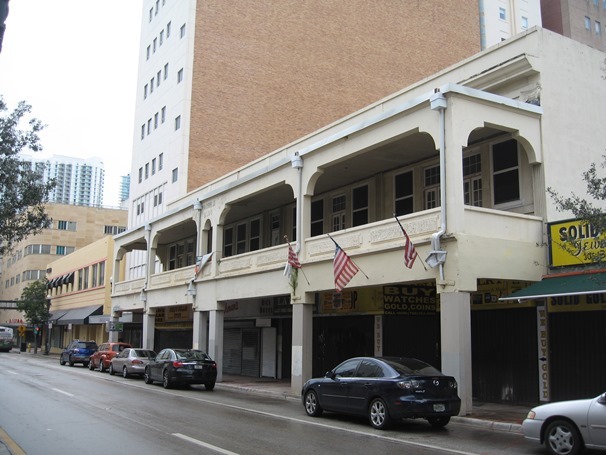 Given th e proximity to the train station in downtown Miami, the Rice Hotel was conveniently located for downtown visitors. One former resident recalled having a great view of the neon Santa Claus above the walkway between the Burdine Buildings during Christmas season. She also recalled watching the New Year’s Eve parade from the second story balcony during her time living in the Rice Hotel in the 1950s. In June of 1921, a Miami News article announced a second Waddell Building which was to be erected just two blocks north of his first building. It was estimated to cost $50,000 to build. The new three story building was built on the corner of North Miami Avenue and Second Street. Similar to Waddell’s first building on North Miami Avenue, it combined both retail and hotel accommodations. The hotel was described by the Miami News as follows: “The hotel lobby will be on the second floor, of spacious dimensions, with a native rock fireplace. There will be 37 rooms in all, many of them with private or connecting baths…An ornamental marquise will extend over the sidewalk on the Miami Avenue side, supported by chains”. There was also space for up to 6 stores at the ground level. Today, there is a three story glass building that resides on the northeast corner of North Miami Avenue and Second Street. The Miami Property Appraiser has the build date for this building at 1925. It is likely that this is the second Waddell building with a new facade and a new use as an office building. However, there are still stores operating at the ground level. On the eve of the 37th anniversary of Miami’s incorporation, EA Waddell succumbed to an illness and passed away. He died on July 27th in 1933. From the day he moved to Miami, Waddell often said that he had come here to “live and die”. Contrary to his expectations, Waddell ended up dying in Murray Hill Hospital in New York after battling illness. He was 74 years of age. He was survived by his wife, Dorthea, whom he married on January 25th in 1900, and his daughter and grandchildren. EA Waddell would not only be remembered as a pioneer, first real estate agent, land developer and co-founder of the First National Bank of Miami, but would be considered one of the greatest advocates of Miami. From the day he first accidently stumbled upon the future site of Miami in 1888, he knew this place would be special for him and many other people. Waddell thought the land of today’s Miami had the potential to host a “big city”. Imagine if he had the opportunity to see the City of Miami now? He probably would be happy to see the evolution of the area. I am sure he would be even happier to see his name still remain on a building he built over 100 years ago. While EA Waddell may not be well known today, he is a rather important part of Miami’s History. Book: ‘Miami and Dade County Florida’ by EV Blackman. 5 Comments on "Miami Pioneer EA Waddell and the Waddell Building"
It was nice to meet you at the William Heath Davis House. Thank you, Alvin. Your insight is always very interesting!! Casey – What a great story built around the name of a man I had never heard of before. I’m glad I signed up for your weekly History after you handed out your cards at Paul George’s South Florida History class. I remember, when I first came to Miami in the early sixties, I would look across to the Miami shore-line from Rickenbacker Causeway coming from Virginia Key at night and the only prominent tall building had a large blue neon bank sign on top of it. I don’t recall the name for sure, but I assume it must have been the bank you refer to of this era. The minute I read the name Waddell,I knew it was familiar. We had a family business at 208 N. Miami Avenue by the name of Sonya’s Ladies Wear. My mother, Sonia Liberman opened it in 1958, & it lasted 38 years. We sold dresses, intimate apparel, childrens wear, uniforms, etc. We used to pay rent to The first National Bank of Miami, who were the Trustees under the Last Will & Testament of Edwin A. Waddell. I used to help my mother at the shop after school (Miami High),& eventually my dad, & husband came into the business.After reading your article, I hunted down some old paperwork, & found the name Dorothy Waddell Doyle. I imagine this must have been his daughter, & the property must have passed down to her. I really enjoyed reading your article, & now I know the rest of the story! We have been closed almost 20 years, but it brought back many memories. The hotel upstairs used to rent rooms to some shady characters,who drank too much. They would pour a bath, & pass out before turning the water off. When we opened in the morning, we had thousands of dollars in water damage to our merchandise. By the way, there was a pawn shop in the corner, a mens shop, our ladies wear shop, & a fabric store.